Double Eagle gold coins with a face value of $20 were designed by Augustus Saint-Gaudens who was a very popular sculptor during President Theodore Roosevelt’s tenure. Saint-Gaudens gold coins were originally designed in high relief with Miss Liberty on the front and an American flying eagle on the back. In 1908 these coins were minted as 24 karat pure gold, and later minting softened the high relief sculpting to a more flat surface for ease of production and storage. The original St. Gaudens did not have the motto “In God We Trust,” since President Roosevelt felt that these coins might be used for illegal activities and these activities would debase the motto. Later editions were commissioned by Congress to include this phrase due to public outcry. The Saint Gaudens gold coin continued to be minted until 1933 when it was declared illegal by the United States government for its citizens to own gold and St. Gauden’s coins were recalled. Some coins did “slip” though the recall and owning St. Gauden’s gold coins is still illegal today. This covert action has contributed to the high value of these gold coins and collectors generally prize and highly secure their “illegal” coins. As a note, those who already owned the coins in collections were allowed to keep them as long as these coins did not circulate through the money system. 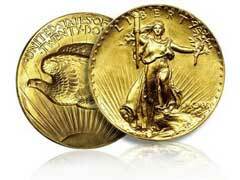 St. Gaudens gold coins are highly valued for both their artistic intricacies and their concentrations of pure cold. The best gold coins for investment include the St. Gaudens High Relief, the Double Eagle and those minted in 1908 and in 1933 and many gold coins generally sell to collectors between $50,000 and $150,000. One exception to this price was a private handling in 2002 where a St. Gaudens gold coin was sold for $7,590,020. Coins with a lower grade or imperfections noted on the coin generally sell for $5,000. Gold coin dealers are your best source for historical prices as well as the current values for each type of these gold coins.